Can Scoot Boots be used for rehabilitation? Scoot Boots are being successfully used for all kinds of rehabilitation. Scoot Boots are great for sensitive soles and can be left on longer than most boots due to their superior breathability. Good breathability is vital in order to prevent a build-up of fungus and bacteria, which can occur when hooves overheat and trap moisture. Scoot Boots can help to relieve toe pressure, which is a necessity for laminitic horses. We also recommend using Scoot Pads if your horse has sensitive soles. Horses can be turned out 24/7 in Scoot Boots. The excellent drainage capabilities of the Scoot Boot mean that your hooves will stay dry inside the boots and the horse's natural hoof heat will dry out any excess moisture. Can a horse's hooves overheat from wearing hoof boots in hot climates? Yes, they can. That is why the Scoot Boot has been expertly designed to have excellent ventilation and breathability. Can I apply studs to Scoot Boots? Do Scoot Boots have good traction? The Scoot product range has excellent traction. The tread pattern is designed to provide traction for the majority of riding conditions, except on ice. However, studs can be used to increase traction on ice. Do Scoot Boots have good drainage? Yes, Scoot Boots have excellent drainage. The side vents and open back, as well as being close fitting, mean that water does not get retained inside the boot. How much does a pair of Scoot Boots weigh? Scoot Boots are very lightweight. The average sized Scoot Boot weighs 350 grams so 700 grams per pair. This converts to approximately 1 pound. How long can Scoot Skins be left on? Scoot Skins can be left on for an entire five-week trim cycle. How durable are Scoot Boots? The Scoot Boot shell and securing straps are made from TPU (thermoplastic urethane), which has excellent abrasion and shock- absorbing abilities. Scoot Boots don’t have any components that will break off. The durability of any hoof boot will depend on the gait of your horse. If your horse has a floating movement, then the boots will last up to a several years with occasional riding. If your horse scuffs and twists its feet, then the Scoot Boots will wear a bit faster. If you participate in endurance riding, you can expect to get up to 1000 kilometres (600 miles) use from a pair of Scoot Boots. Again, this will depend on how light your horse is on its feet. In the event of losing a metal shoe, can Scoot Boots be used as a ‘spare tire’? Yes they can, provided your horse’s hooves have been correctly maintained. I live in a country where the winter temperatures make the straps less flexible. How can I solve this problem? We advise that customers store their Scoot Boots inside during the winter months. This will keep the straps flexible. I have heard that Scoot Boot sizes run large. Is this correct? No, it is not correct. The reason this is said is because many people measure the length of the hoof incorrectly, stopping at the wrong position. As a result, we encourage everyone to take advantage of our FREE sizing service. If we get the size incorrect, we will cover all costs to exchange. Please see our Sizing Advice page for further information. The screws on my Scoot Boots keep coming loose. What is the cause and how can this be fixed? When riding, there is a lot of concussion applied to your boots, which can work the screws loose. Loctite, which is a thread locking glue, is applied to all screws during production to help prevent this. In the event that the screws do come loose, apply Loctite 222 before inserting. This is a low strength glue which is strong enough to hold the screws in place, but loose enough to allow you to remove the screws in the event you need to replace your straps. Loctite can be purchased from most hardware stores. What is the function of the Front Closure Straps? The Front Closure Straps are designed to make the application and removal process of the Scoot Boot very simple and practical. As with the pastern strap, the front closure straps are made of thermoplastic urethane (TPU), which has excellent strength and flexibility. When securing and removing the boots, always stretch the front strap across the holes before pulling the straps off the knob hooks. The diameter of the holes is 6mm (1/4"). For riders with weak fingers, the front straps can easily be attached/unattached using a hoof pick. 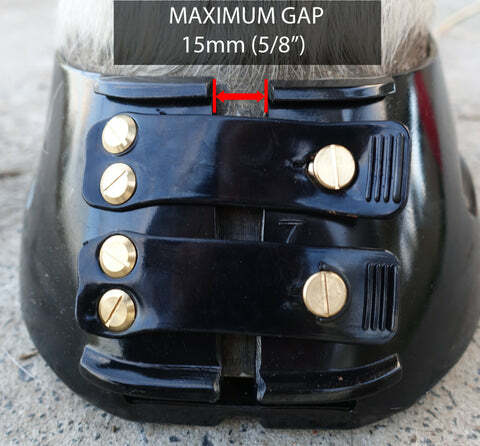 What is the purpose and correct setting of the Pastern Strap? The Pastern Strap is designed to help prevent the boot being pulled off due to an overreach, or sucked off when riding through mud. It is not intended to be the primary source of securement. The strap is made of very strong thermoplastic urethane (TPU) and is designed to stretch when placed under load, so the strap will not affect the horse’s pasterns if secured correctly. It also has a number of holes to provide the correct setting, depending on the thickness of the horse’s pasterns. To set the strap at the correct length, make sure your horse is standing upright with its legs at 90 degree. Once secured, you should be able to place one finger (large) or two fingers (small) under the straps at the front of the pastern. What is the purpose of the Pastern Strap Lock? Pastern strap locks are designed to provide some extra security when riding through muddy conditions or through thick vegetation. Pastern strap locks are constructed of nylon and can be purchased as a Pastern Strap Lock Pack with each pack containing 8 locks. What is the difference between Scoot Boots and Scoot Skins? Our Scoot Boot and Scoot Slims range are the preferred hoof protection for the majority of riding disciplines. Scoot Skins are specifically for elite endurance riders who ride 80km-160km and want additional security. Scoot Skins are glued to the hoof and are recommended to use in disciplines where boots are not permitted. They can also be used for rehabbing unattended horses. What is the purpose of the Mud Strap? The Mud Strap has two purposes. Firstly, it provides ultimate security when riding in extreme conditions. 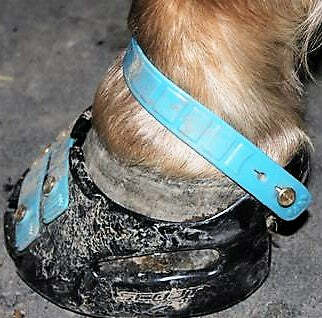 Secondly, the Mud Strap can be used to assist hard-to-fit-hooves. For example, if your horse is in-between sizes, the Mud Strap can be fitted to the larger Scoot Boot and still have security. However, it important that you have the correct sized Mud Strap. The Mud Strap can also be used to obtain a more secure fit if your horse requires Scoot Pads and has consequently needed a larger sized Scoot Boot. Are Scoot Boots easy to fit? Fitting your Scoot Boots - simple and easy! As my horse’s hooves grow, am I able to adjust the straps on the Scoot Boots? No adjustment is required as the boots are secured by the parts of the hoof that do not grow. If the correct sized boot is used, the security will come from the upper part of the boot and not the straps. Can I use wrapping tape to help me fit my Scoot Boots? Scoot Boots are constructed of TPU (thermoplastic urethane). This is a very robust material, which provides shock absorption for the hoof, has high abrasion qualities, and will not become distorted by hot or cold weather. However, TPU is easily corrupted by certain chemicals. It is very important that you keep your boots free of any likely contaminants, which will compromise the integrity of your boot. Please note: We have identified that the widely used equine product “VetWrap” will cause a reaction with the TPU. As a result, "VetWrap" should not be secured directly to Scoot Boots as this will void your warranty if any damage occurs. Can Scoot Boots be heat-fitted to get a custom fit? Yes, they can. 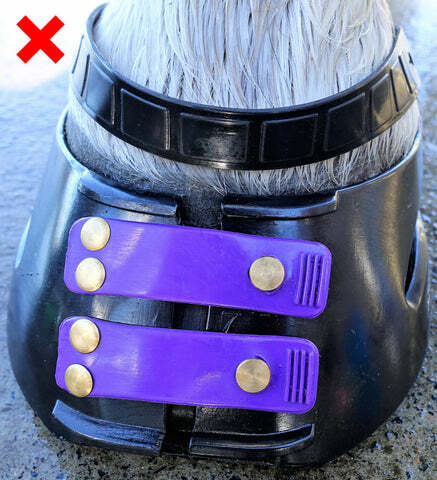 With some hooves, Scoot Boots can fit perfectly around the periphery of the hoof, however the heel straps are too tight with not enough space to slip a finger between the heel straps and the heel bulbs. Heat-fitting can fix this issue. Please click HERE to view a short, video, which demonstrates how to stretch the heel straps with a heat gun. *Note: it is vital that the heel straps are stretched no greater than 1/4'' (5mm). This equates to a full boot size. Over-stretching will compromise the fit and heat-fitting voids your warranty. Can horses with feathered hooves wear Scoot Boots? Absolutely. The boot fits on the hoof, neatly under the feathers, and the pastern strap secures around the pastern over the top of the feathers. Do I require Scoot Boots on all four hooves? The majority of riders only use boots on the front hooves as the front end of the horse bears approximately 60-70% of a horse’s body-weight during motion. This is why the majority of lower leg injuries are sustained to a horse’s front legs. The rear legs mainly propel the horse and as a result experience significantly less direct weight bearing. However, if you are endurance riding or riding over extreme surfaces, and your horse’s hooves have not fully transitioned, then you will likely require boots on all four hooves. Please see our blog for further information on transitioning your horse to barefoot. Do I need to use pads in Scoot Boots? No, Scoot Pads are only necessary if your horse has very sensitive soles. The sole/shell of Scoot Boots/Scoot Slims are constructed from TPU, which has high, shock-absorbing capabilities on its own so there is no need to use pads on a healthy, full-transitioned hoof. Do the side vents in the Scoot Skins interfere with the gluing process? No, the side vents actually provide a huge advantage when gluing. Simply place masking tape over the vents on the outside as this allows glue to penetrate the area and form a plug, which adds to glue strength. Do I need to break my horse into Scoot Boots to avoid rubbing? When you ride for the first time in Scoot Boots, you must give your horse’s skin time to adjust as all horses have different levels of sensitivity. After your first ride you will find that the boots will mould to the shape of the hoof. Do not embark on a long ride. For example, do not ride more than 6 kilometres (4 miles) at a time, until you are assured that the boots are not chaffing/rubbing. If there are no issues, gradually increase your distance each time you ride as this will gradually condition your horse’s skin. We ask that you please use common sense and treat your horse’s pasterns/lower hoof the same as you would your own hands. For example, if you do too much hard, physical work all at once using your hands, you will likely end up with blisters. Whereas gradual, physical work will eventually toughen your hands/skin and therefore eliminate future issues. Your horse’s skin is no different. We provide complimentary trail gaiters with every pair of Scoot Boots to use when and if required. You may also like to purchase a set of endurance gaiters, which can be used for long distance/endurance riding. Please note if you do not allow a two finger space between the pastern and the strap, this may cause rubbing. This is because when tension is applied to the strap, the heel of the boot will continually be pulled against the side of the rear of the hoof, thus causing friction and rubbing. How can I tell whether I have the correct size? Please view our Fitting page for instructions on how to check the fit of your Scoot Boots. How can I tell if my Scoot Boots are too small? When you fit your Scoots for the first time after a fresh trim, you should be able to comfortably slip your horse’s hooves into the boots. If effort is required to get them on, you most likely have boots a size too small. If the boots are too small, you will most likely find that the heel strap of the boot is too tight over the bulbs. You should be able to slip a finger between the bulbs and the strap. When the straps shave been secured, the gap at the front of the boot should be a maximum of 5/8" or 15mm. After your first ride, you will find that the boot will mould to the hoof and the gap will reduce in width. An ideal gap is approximately 3/8" or 10mm. If the front gap remains at 15mm (5/8") after your first ride, this means the boots are a size too small. How can I tell if my Scoot Boots are too large? This photo shows lack of contact of the upper boot around the coronet. 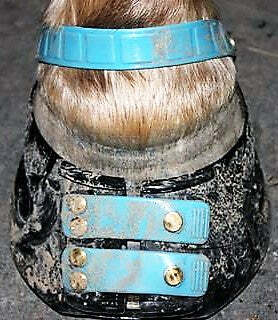 This photo shows a hoof too wide for Scoot Boots, as indicated by the lack of contact below the coronet band. How do I fit my gaiters on my Scoot Boots? We produce and sell two types of gaiters: endurance gaiters and trail gaiters. Please view the instructional videos below showing how to fit your gaiters. How do I size for Scoot Skins? Scoot Skins fit differently to our regular Scoot Boots. When measuring for Scoot Skins, measure the width of the hoof and select the size indicated on the Skins Sizing Chart. I’ve just removed shoes from my horse’s hooves, what do I do to transition to boots? Firstly, it is important to realise that there is a big difference between how your horse’s hooves are shaped now, and how they have to be shaped to wear hoof boots. A shape of a shod hoof is far different to a hoof that has been kept shoe free with regular “natural trims”. A shod hoof has a lot more toe, heel and wall than a naturally trimmed hoof, therefore the excess must be removed prior to using hoof boots. Is there a specific trim my horse requires in order to use Scoot Boots? The heels are kept low, as a barefooted horse does not require excessive heel length. All flare is removed from the hoof walls. A straight edge should be able to be placed from the coronet to the bottom-edge of the hoof wall at ground level. There should be no space visible under the straight edge. The ‘ground-bearing’ surface of the outer hoof wall should be beveled. This prevents the hoof wall from chipping. It also prevents the whiteline stretching and ensures a neat, strong hoof. The toe is short and rolled to create a good break-over. The roll is generally in the vicinity of 45 degrees. Please see our blog for further information on trimming, or view our instructional video on how to perform a natural barefoot trim. I have never used glue-on boots before. What are the gluing tips for fitting Scoot Skins? Hoof preparation: Your horses’ hooves need to be cleaned and buffed in order to remove all moisture, grease and dirt. A rough surface will also aid in glue attachment. The inside of the Scoot Skins should be cleaned with an alcohol-based solvent cleaner to remove any contaminants. The inside of the skins should be cleaned with an alcohol-based solvent cleaner to remove contaminants and then buffed to create a rough surface to aid glue bonding. Gluing: Gluing is an acquired skill, therefore you will need to seek out a skilled hoof care professional who is experienced in the art of gluing to do the initial work. Please view the instructional videos below for further information. Is there a glue that Scoot Boot can recommend using for fitting Scoot Skins? We recommend only using Vettec Adhere or Equibond glue. Other glues may contaminate your Scoot Boots, which will void your warranty. My horse has high heels, will Scoot Boots be suitable? 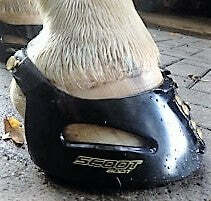 If you would like to use Scoot Boots, you will need to contact your local barefoot trimmer to correct the hoof form. The following photos show excessive heel height of the hoof. A hoof with excessive heel and wall height, which is preventing proper securement. Heel bulb straps that are sitting too low over the bulbs. Excessive distance at the front and sides between the top edge of the boot and the coronet. The ground parallel hairline indicates the heels are way too high/long. Before Scoots are suitable, the heels need lowering which will greater improve hoof function as well as boot fit. The distance between the top of the boot and the coronet should be no more than 10mm (3/8"). 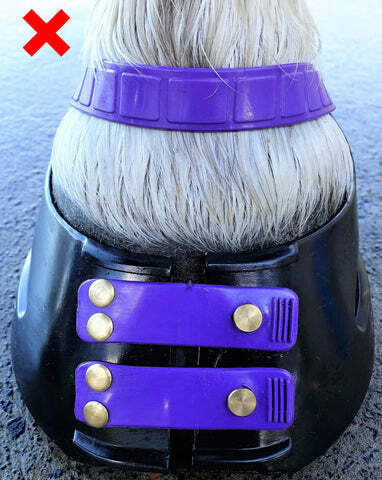 This horse requires a correct barefoot trim before wearing Scoot Boots. My Scoot Boots are twisting. Have I got the wrong size? If Scoot Boots twist on the hoof, the boots are either too big or the horse has an excessive twisting action due to conformation. 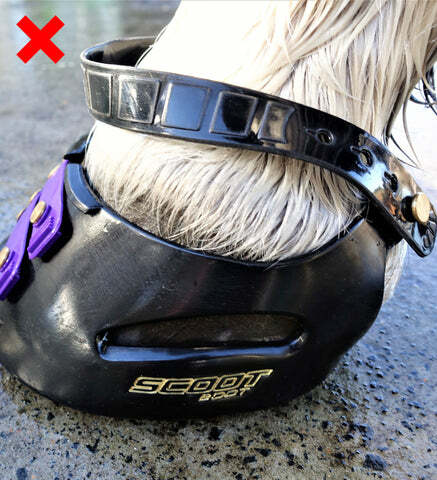 Conformation means that Scoot Boots will not be suitable for your horse. If the twisting is minimal, we recommend you use Scoot Anti-Slip Shims to secure the fit. Scoot Shims are also a great aid for the securing fit when a horse is in-between sizes, or when conditions are dry and your horse’s hooves have shrunk making the boots a bit loose. My Scoots fitted well when I first received them but now seem too loose. Why is this? Your horse's hooves have dried out and reduced in size. 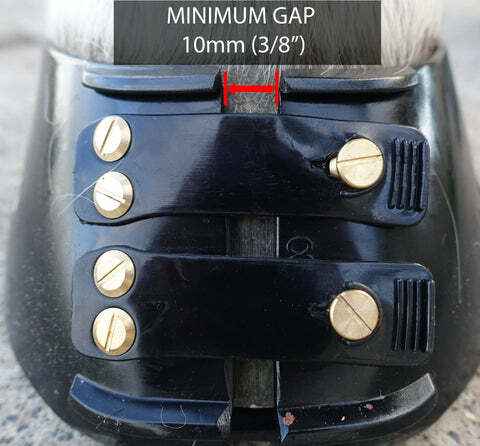 It is very important that your horse has been trimmed correctly before you first measure, with all excess hoof wall removed, as hooves can reduce or increase up to half a size at a minimum. This is because a horse's hoof is made up of 70% water so when ground conditions dry out, hooves actually shrink in size as moisture is lost. When ground conditions are continually wet, the hooves will swell as they absorb water and become larger. This results in boots becoming too tight or too loose. If your boots have become too loose we recommend you use Scoot Anti-Slip Shims to provide a more secure fit. If you need extra padding, you can use Scoot Pads. Alternatively, many riders use two different sizes of Scoots for summer and winter. My horse has very steep-walled hooves. Will Scoot Boots be suitable? No, this hoof shape has a coronet diameter equal to or larger than the width of the bottom of the hoof. 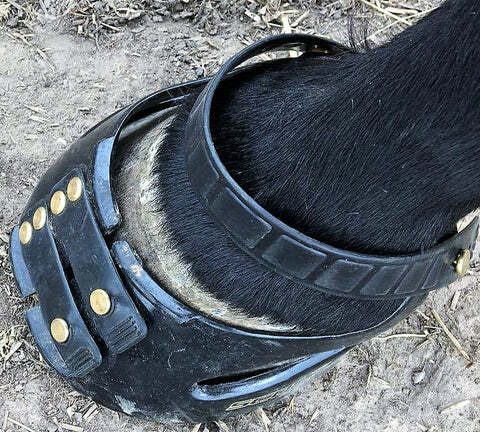 This means the walls of the boot are forced into a vertical shape to match the hoof wall and, as a result, the front of the boot is spread too far apart for the front straps to be secured correctly. Should the correct size boots allow for any rotation on the hoof? If the boots are the right size and correctly secured, the boot should not rotate on the hoof. If this occurs, you may have a size too big. Please see our Fitting page for further information. Will my horse need the same sized boots on both front and back hooves? Two-thirds of horses need boots a size smaller for their rear hooves. Rear hooves are often narrower in shape than the front hooves. Scoot Slims are more likely to fit the rear hooves than Scoot Boots. The majority of horses will only require boots on the front feet unless you are riding excessive distances or over extreme terrain, or your horse’s hooves are still transitioning or are just naturally sensitive. When using Scoot Boots, how often should I trim my horse? If using the correct sized Scoot Boots, you can allow for a 5 to 6 week trim cycle. A horse’s hoof growth slows dramatically over the drier and colder months, so during summer (unless you have a wet summer) and winter you can have increased riding time between trims. Please see our blog for further information on trimming. What are should be glued inside the Scoot Skins? We strongly recommend keeping the bottom 15mm of the skins, or just over 5/8" above the sole, glue-free. It is vital that the glue does not get under the sole of the hoof as any lumps of glue are likely to cause bruising. When I boot my horse up, the front of the boot is forced open more than what is recommended. Why is this? Your horse has not had a correct barefoot trim and either the toes are excessively long. the hoof is too wide for the boot, or your horse is at the end of its trim cycle. Your boots are a size too small - let us help you with sizing. 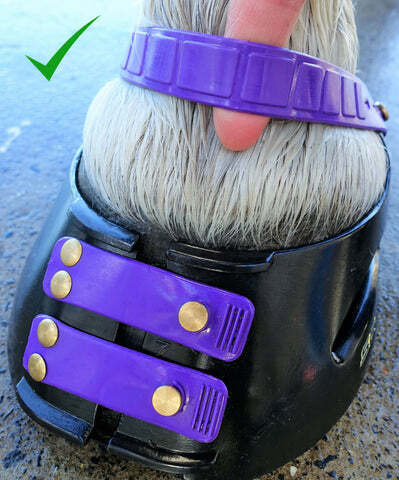 The walls of your horse's hooves are too vertical and are therefore not suitable for Scoot Boots. Vertical hoof walls are usually present in mules and club feet and prevent getting a secure fit. Please see our Fitting page for further information. Why do barefoot horses require minimal heel height while stod horses require maximum heel height? When a metal shoe is placed onto a hoof, the toe of the hoof is immediately lengthened. This results in a slower break-over speed, which in turn increases lever forces on the tendons at the back of the horse’s front legs. In order to keep a shod horse sound and prevent tendon injuries, keeping a higher heel height temporarily neutralises the lever forces to the tendons. 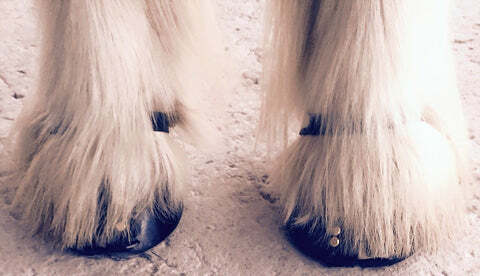 Barefoot hooves have a rolled short-toe so, with correct trimming, there are very few lever forces present. As a result the heels can be kept low and maximum frog/ground contact occurs, which is not only beneficial to the hoof but the horse’s entire body. You may be able to recycle your Scoot Boots. You will need to check whether your local recycling depot provides a service for disposing of urethane products. Are Scoot Boots easy to clean? Yes, Scoot Boots are very easy to clean as they are a ‘one-piece’ moulding. There are no cables or Velcro and the boots can simply be hosed clean at the end of a ride. Do not use any chemicals such as copper sulphate, inspect spray or cleaning agents as they can react with the TPU and damage your Scoot Boots and void your warranty. Can leaving Scoot Skins on for extended periods result in hoof health issues? Due to the air circulation, Scoot Skins allow the sole to ‘breathe’, which helps to prevent a build up of bacteria or fungus. The soles can also be flushed and medication applied during the five week setting. Please see our blog for further information on diseases. Can I do my own repairs on my Scoot Boots? Thread locking glue such as Loctite 222 (to be applied to the screws before securing). Can I use hoof oils/grease when using Scoot Boots? No, you cannot use hoof oils or greases. Oils and greases make the inside of the boots slippery. They are also not necessary. A horse’s hoof wall consists of approximately 70% water. When conditions are dry, moisture is evaporated from the hooves and they reduce in size as well as get dry and brittle. You need to replace the water that was lost, certainly don’t use grease or oil. How do I prepare my horses' hooves for fitting Scoot Skins? Your horses’ hooves need to be cleaned and buffed in order to remove all moisture, grease and dirt. A rough surface will also aid in glue attachment. The inside of the Scoot Skins should be cleaned with an alcohol-based solvent cleaner to remove any contaminants. The inside of the skins should be cleaned with an alcohol-based solvent cleaner to remove contaminants and then buffed to create a rough surface to aid glue bonding. I am interested in stocking Scoot Boots. What do I do? Please visit our Stockists page for further information and to register your interest. I'm a show jumper. Can horses jump in Scoot Boots? Yes, they can. Jumping can place stress on the horse's tendons and the ligaments that support their legs during push off and landing. The impact from landing can also damage structures in the front hooves. Metal shoes on a horse increases this concussion significantly. The material of the Scoot Boot is specifically designed to minimise the impact of concussion. There are elite show jumpers jumping successfully in Scoot Boots at grand prix level. You will need to check your respective FEI rules but in most countries boots are allowed in competition. Are Scoot Boots suitable for endurance riding? Yes, Scoot Boots can be used for endurance riding. Prior to embarking on a long ride, test your Scoot Boots over short distances to ensure performance and that there is no chaffing/rubbing. If there are no issues, gradually increase your distance with each ride. Over time this will condition your horse’s skin. We recommend using one of our gaiter packs for endurance riding. Our Endurance Gaiter Pack contains two pairs of neoprene endurance gaiters, which provide protection for the lower back of the pastern and rear coronet area. We also sell trail gaiters. Our Trail Gaiter Pack contains two pairs of neoprene gaiters, which provide protection for the lower back of the pastern only. These are most suited to general trail riding. EVA gaiter tape can also be used in conjunction with or instead of trail or endurance gaiters for added or tailored protection. 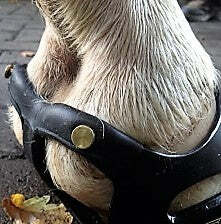 If you know your horse has sensitive skin we advise you to allow your horse time to slowly adjust to using Scoot Boots. Do not ride more than 6 kilometres (4 miles) at a time without checking the back of your horse’s pasterns for rubbing. Every pair of Scoot Boots comes with a complimentary Trail Gaiter Pack. Please click HERE to view our instructional video on how to secure your endurance gaiters.